1What browser do I need to have to use SMASHDOCs?2What are the minimum system requirements for using SMASHDOCs?3What are the system requirements to use SMASHDOCs on mobile?4I have registered but cannot log in, what can I do?5How can I change the language?6How can I download/change profile picture?7How can I change my password?8I forgot my password, what now?9Can I change my e-mail address?10Where can I find an overview of my documents?11How do I create a new SMASHDOCs document?12What is the difference between the file name and the document title?13How can I rename the document?14Why can't I rename the document?15How do I access the document list from an open document?16How can I copy a document?17Can I edit documents offline? 18Can I create and edit documents on my phone or tablet?19Can I change the font in SMASHDOCs?20How can I insert a new text section?21Can I also insert content from other SMASHDOCs documents and external sources? 22Can I also merge the sections? 23How can I delete a section?24How can I create a heading?25How can I create headings with outline numbers?26How can I move the text sections?27How can I create a list?28How can I create numbered lists?29How can I format the text?30Can the text in SMASHDOCs be colored?31Why are pages and words not counted?32Can I also work with keyboard commands in SMASHDOCs?33 Can I enter Unicode characters directly from the keyboard?34How can I select several sections of text at the same time?35How can I import a document?36What types of files can I import?37Why can I only import documents as.docx?38Why does the import of the Word document isn't working?39I have inserted changes in correction mode in one of my Word documents, but now want to import and edit the document in SMASHDOCs. Will the changes and their history also be applied?40How can I delete a document?41How can I create a new folder?42 How can I rename the folder?43How to move documents and folders?44How can I delete a folder with documents?45Why can't I delete documents that have been released for editing?46How can I switch the tooltips on or off?47How are changes saved in text sections?48What does "Start Review" mean?49How do I invite other users to a document?50What are the different user roles?51What are additional rights?52How many users can I invite to a document?53I have invited a user to a document, but I want to undo it. Is that possible?54Can I still change the user roles later?55I have been invited to a document - where can I see my user role?56Can I change my user role in the document?57Where can I view all users working on a document?58I have been invited to a document - where can I find the new document?59How do I know if someone invited me to a document?60How can I insert the changes in review mode?61Why can't other users edit my new sections in a document shared for review?62How can I release a draft section for review?63How can I check if there are other sections that I have created and that I still need to approve?64How can I incorporate suggestions for changes?65Who can decide on proposed changes in the document?66How do I mark changes as seen?67How can I accept changes?68How can I reject changes?69Why can't I change the contents of a document shared for review?70I deleted a section completely - can I undo it?71What is a section history?72How can I find out who inserted the content if there has been no section history yet?73Where can I view the section history?74I like an older version of a section better than the current one - can I restore the older formulation?75How do I know if there are new changes in a document?76How can I find out whether there are new conversation contributions in a document?77What do the different colors and underlays in a document released for editing mean?78How can I insert new sections into a draft document?79How can I insert new sections in a document that has been released for editing?80How can I insert images?81How can I replace images?82How can I view previous versions of the image?83How can I create comments for images?84Why can't I upload an image or replace an existing image?85How can I insert tables?86How can I edit tables?87How can I view previous versions of a table?88How can I format tables?89How can I add/remove a new row/column?90How can I combine cells?91Can I import files in Excel format into SMASHDOC?92Can I import files from the Excel table into SMASHDOC?93Why can't I insert or change a table in a document shared for review?94How can I insert footnotes?95How can I edit footnotes?96Why can't I insert a footnote or edit an existing footnote in a document shared for review?97How do I delete footnotes?98How can I insert web links?99How can I edit web links?100How can I delete web links?101How can I create comments?102Can I delete comments?103Who can see comments?104How do other users know that I have made a comment?105How do I see comments from other users?106 Can I write an email to all/selected users from SMASHDOCs?107 What is an announcement?108 How do I write an announcement?109 What is a cross-reference?110 How can I refer to a section in the text?111 How can I change a cross-reference?112 How can I delete a cross-reference?113 How can I find all sections referenced in a section?114 How do I find the section that was referenced?115 How do I know that a section has been referenced by the other section?116 Are cross-references automatically renumbered when I change the numbering in my document?117 How can I see if a cross-reference is no longer valid?118How can I bookmark the section?119 What is a bookmark for the section?120 Why do I need a bookmark for the section?121 What is a section link?122 Why do I need a section link?123 How can I create a table of contents?124 Where can I find the table of contents?125 How can I export a table of contents?126 How can I set multiple/fewer levels in the table of contents?127 How can I influence the display of different lists?128 List of images129 List of tables130 List of footnotes131 List of links132 Why can't I insert a web link or edit an existing web link in a document shared for review?133 How can I insert cross-references?134 Why can't I insert a hyperlink or edit an existing hyperlink in a document shared for review?135 Can I create a table of contents in SMASHDOCs?136 How can I insert (numbered) lists into a document?137 How can I superscript or subscript a part of a word?138 How can I insert a page break?139 How can I add a comment to a section?140I would like to send a comment only to certain users - is that possible?141 Why can't comments be made in newly created sections?142 How can I export / print a document?143 How can I export a document to a Word file?144 What HTML reports are available?145 Can I communicate with other users in real time while editing documents, for example by chatting with them?146 How can templates for export be personalized?147 How can I delete my account? 1What browser do I need to have to use SMASHDOCs? We support all the latest versions of Chrome, Firefox, Safari both for Mac and Windows, Internet Explorer 11 and Edge. 2What are the minimum system requirements for using SMASHDOCs? 3What are the system requirements to use SMASHDOCs on mobile? 4I have registered but cannot log in, what can I do? After successful registration with SMASHDOCs a confirmation mail with an activation link will be sent. Only after clicking on this link your account is activated and you can log in. Occasionally it might also happen that a mail program considers this email as spam and moves it to the spam folder. If the mail did not arrive or was accidentally deleted, you can have a new activation link sent to you by clicking on "Have you forgotten your password? 5How can I change the language? To change the profile language, click on your avatar and select "Settings" and again "Settings". Then you can choose the desired language. 6How can I download/change profile picture? Click on your avatar and choose "Settings". Then click on the picture with your initials. Now you can simply drag and drop your new image to upload it or select an image from your computer. 7How can I change my password? To change your password, click on your avatar, select "Preferences" and again "Preferences", then go to "Security", there you can set a new password. 8I forgot my password, what now? To get a new password, go to the login page, click on "Forgot your password", enter your e-mail address. You will then receive instructions on how to proceed to set a new password on this e-mail address. 9Can I change my e-mail address? No. Changing your email address is not possible. 10Where can I find an overview of my documents? You always have an overview of all your documents in the "My Documents". It will be displayed immediately after logging in or when you click on the SMASHDOCs logo in the upper left corner of your open document. 11How do I create a new SMASHDOCs document? To create a new SMASHDOCs document, click on the green plus button in the lower right corner of the document overview and select "Write document". A dialog box opens in which you can enter the metadata of your document, such as file name, title and subtitle of the document, description, tags and a footer. Click on the button "Create document" to save the new SMASHDOCs document and you can start working on it. A new SMASHDOCs document is always saved as a draft document, which can only be viewed and edited by you. No changes are logged in this mode. If you would like to give other users access to it, you would have to share it for editing. We explain how this works in FAQ 44 . 12What is the difference between the file name and the document title? The document title is what appears as a heading in your export. So you don't have to add an extra heading to your document. You can specify the document in a more detailed way in the file name. Here is an example: if you are writing a manual, the document title would be "Manual Version 2.0". If you export your document, exactly this title will be set as heading. You can enter further information in the file name, for example "Manual for Copier XY, Version 2.0, German". This does not appear in your export. The file name of the document is displayed in your document list. Of course, our search function takes both file name and document title into account in the keyword search. 13How can I rename the document? Open the document, click on "Show document options" and select "Edit metadata". A dialog box opens in which you can change the metadata of the document. There are other options: via the document list. To do this, right-click on the document and select "Edit". You will get a dialog box where you can change metadata. Click on "Save document" to save the changes. The process is the same to edit titles, subtitles, descriptions, tags and the footer. 14Why can't I rename the document? You do not have the right user role or additional rights. Only users with the role "Approver" and the additional "Admin" authorization can change the name of a document. This applies to the document name, title, subtitle, description, tags and footer. For more information about the user roles, read FAQ 50. 15How do I access the document list from an open document? Click on the SMASHDOCs logo in the upper left corner and you will return to your document list. 16How can I copy a document? To copy a document, right-click on the document in the document list, or left-click on the context menu button and select "Copy". You will then see a dialogue box in which the reference data of the new document can be entered. After clicking on "Save document", the document will appear in the currently displayed document list. 17Can I edit documents offline? No. SMASHDOCs is a pure web application, i.e. you always need an internet connection to work with it. 18Can I create and edit documents on my phone or tablet? Basically yes, but SMASHDOCs is not (yet) optimized for use on tablets and smartphones. We currently recommend that you only use the web browser on your desktop computer or laptop. 19Can I change the font in SMASHDOCs? You can choose which font you want to use in your SMASHDOCs document in the formatting menu. Whether these settings are transferred into the export format depends on your stored template. With SMASHDOCs Premium, your document is exported directly to the format you set, so you don't have to worry about the right font and formatting. With a standard export you can then adjust the font in the Word document. 20How can I insert a new text section? Click on a text section and press ENTER to create a new text below it. 21Can I also insert content from other SMASHDOCs documents and external sources? Just copy the text passages you want to paste into your SMASHDOCs document with Ctrl / CMD + C and paste them with Ctrl / CMD + V to the desired location. SMASHDOCs creates a new section for this. If you want to insert the text passages into an existing section, you should use the key combination Ctrl / CMD + Shift + V.
22Can I also merge the sections? If the document is in the draft mode (and changes are not recorded), the procedure is analogous to WORD. If the document is in the review mode, in which changes are recorded in each section, you can also merge two sections via BACKSPACE at the beginning of the section. Although the additional confirmation is required. 23How can I delete a section? Click on the section you want to delete. A small trashcan icon will appear at the top right of the section, click on it. In draft documents, the section is then completely deleted and cannot be restored. In documents that shared for review, the section is then adjusted as a red strikethrough text and suggested for deletion. 24How can I create a heading? To turn existing text sections into headlines, click with the left mouse button on the text section that you want to have as headlines. Then click on "Heading" at the top of the formatting list and select the heading level. 25How can I create headings with outline numbers? If you want to number a heading, left-click on the section of text you want to number. In the formatting list at the top, click on "Heading - outline numbered" and select the heading level. SMASHDOCs always offers you the logically correct numbering. Even if you move the headings with numbering, the remaining numbering is automatically adjusted. 26How can I move the text sections? The text sections can be moved in both draft and review modes. To do this, left-click on the section you want to move, move the mouse to the left edge of the area where the "handler" appears. Click with the left mouse button on this handler and drag the section to the desired position. 27How can I create a list? Select the sections to be numbered. Please, note that the sections you want to select should be directly below each other. Click on "List" in the formatting bar and sections will be formatted. 28How can I create numbered lists? Select the sections to be numbered. Please note that sections you want to select should be directly below each other. Click on "List-numbered" in the formatting bar and the sections are formatted. 29How can I format the text? To format a text, left-click on the text section or particular words. Select one or more formatting functions from the formatting bar at the top. The entire section or the selected words will be formatted accordingly. 30Can the text in SMASHDOCs be colored? In the standard version of SMASHDOCs it is impossible to highlight the text in color. The user can only select background color. Please note: the background color settings are not applied after the exporting option, therefore we recommend you to make text color changes only after export to the desired format was done. 31Why are pages and words not counted? Since SMASHDOCs are about creating and reconciling documents, the number of pages and words is superfluous. When exporting to any format (e.g. Word), the pages and words are then automatically calculated (e.g. by MS Word). 32Can I also work with keyboard commands in SMASHDOCs? 33 Can I enter Unicode characters directly from the keyboard? Under Windows, you can enter any Unicode character with the corresponding codepoint table directly from the keyboard; e.g. for → (arrow to the right) key combination: Alt + 26. 34How can I select several sections of text at the same time? Right-click on the text section, print and hold Shift for Windows or Shift+CMD for MAC users. Then click on the other text section above or rounder. All sections that lie between the two selected text sections are selected. Unfortunately it is not possible to select several sections from different parts of the document. 35How can I import a document? Click on the green plus button at the bottom right of the document view and select "Import MS Word document". In a dialog window you can now either insert a document by Drag & Drop or search on your PC for it. In the second step you can decide how the formatting should be taken over in SMASHDOCs. In the third and last step, edit the metadata of your document and click on "Create document". Your MS Word document is imported and displayed as a draft document in the document list. Please note that SMASHDOCs only supports the import of.docx files. Files in.doc format cannot be uploaded. 36What types of files can I import? Currently you can import documents in.docx format and in.sdox format in SMASHDOCs. 37Why can I only import documents as.docx? It has a technical background. Docx is the standard format from the MS Word version of 2007 and thus simply more up-to-date. It is also much more space-saving and faster than the doc format because it stores the layout in XML and CSS files. Therefore you can only import the current.docx version into SMASHDOCs. 38Why does the import of the Word document isn't working? It is not a".docx" formatted document. Your document holds content or formats that (still) prevent import. Unfortunately, everything is possible in MS Word that in a few cases can lead to an import failure. In this case, simply create a support ticket via https://support.smashdocs.net/en and send us the Word document that cannot be imported. We will be happy to analyze them for errors and correct them, if possible, so that you can import your document in the future. Every error reported to us helps us to further improve the import! 39I have inserted changes in correction mode in one of my Word documents, but now want to import and edit the document in SMASHDOCs. Will the changes and their history also be applied? 40How can I delete a document? You can easily move documents to the recycle bin by clicking on the icon to the right of the document name in the document list and selecting "Move to recycle bin" in the context menu. If the document is in the trash, you can restore it just as easily. Open the folder "Recycle Bin" and click on "Restore" in the context menu. Please note that restored documents will end up in the "My Documents" folder and you can move them from there again if you wish. 41How can I create a new folder? To create a new folder, go to "My Documents". Right-click on "My Documents" and select "Create new folder". In new windows enter the name of the folder and press "Create folder". The folder is created and appears on the left under the "My Documents" main folder. The folders in consecutive hierarchy levels can be placed above the respective context menu of a subfolder. 42 How can I rename the folder? Click on the order you want to rename, choose "Edit". A dialog box opens in which the new name of the folder can be entered. The name will be updated when you click on "Save Folder". 43How to move documents and folders? There are two ways to move documents and folders. 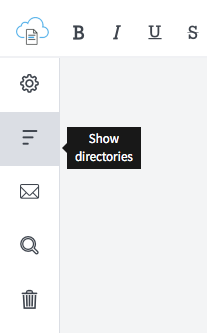 Just Drag and Drop: select the folder or document you want to move and right-click it to drag it to the new location. For folders: if there are already folders at this level, the new folder is automatically inserted into the structure in alphabetical order. You can also move documents using the context menu. To do this, right-click on the document and select "Move" from the context menu. After you see a dialog box with all folders. Click on the folder to move it here. The dialog box closes and the document is moved. 44How can I delete a folder with documents? If a folder containing documents is deleted, they are automatically moved to the "My Documents" folder. If the documents are also to be deleted, they must be deleted individually. How this works can be found in FAQ (How can I delete a document?). 45Why can't I delete documents that have been released for editing? Documents that have been released for processing can be processed by a large number of people. Therefore, even as administrator and creator of the document, it cannot be permanently deleted. Each user can move the document to the trash, but only to his own. He then no longer receives notifications of new changes or comments in the document. All other users can still see the document in their document list and can edit it and coordinate it with each other as usual. This prevents documents and their history from being deleted without authorization. 46How can I switch the tooltips on or off? Tool tips are usage hints that appear when you hover your mouse over an icon. They show you which function is hidden behind this button. You can switch it on or off by clicking on your profile picture in the document list and selecting "Settings". Under "Settings" you will now find "Show Tooltips". If you set a checkmark for this they are switched on, without the checkmark not. 47How are changes saved in text sections? If you have not yet released your document for editing, changes are saved automatically. After sharing with other users, your changes are automatically saved in review sections when you click outside the section. You can also save the changes manually using the key combination CMD/ CTRL + S or you can click on the green button that appears in the top right-hand corner as soon as you make new changes. 48What does "Start Review" mean? "Start review" means to share your document with other users. During the review process, you invite any number of users to the document and assign different user roles (see FAQ (What are the different user roles?)). Then you can edit your document together with the invited users. 49How do I invite other users to a document? If you have not yet shared your document with other users, then click on the blue button "Release for revision" in the header of the document. A dialogue box opens and you can now enter the names or email addresses of the users with whom you want to edit the document together. Finally, click on "Release for revision" and the users will be invited to your document. If you have already shared your document with other users, but would like to add more, then click on "Document options" and select "Invite user". Again, a dialog box will open and you can invite other users to your document by entering their names or email addresses. You also have the option of composing a message that can be sent together with the standard message about the invitation to collaborate for all users mentioned. 50What are the different user roles? In contrast to the additional rights (see FAQ (What are additional rights? )), only one user role can be assigned per user. Furthermore, the assignment and modification of user roles in a document released for editing is only the responsibility of those users who have the additional "Admin" right! In contrast to the user role, the number of additional rights per user can be decided. In this way, all three additional rights can also be assigned to a user. 52How many users can I invite to a document? The number of users you can invite to a document depends on the deployment option you choose. If you have any questions, please contact your system administrator. 53I have invited a user to a document, but I want to undo it. Is that possible? If you want a user to no longer be able to work on a document, you have the option of deactivating it in the document by unticking the box "Active" in the tab "Manage users". Please note that only document administrators can deactivate or reactivate users. Deactivated users are immediately notified automatically by email about the deactivation and then no longer see the document in their document list. If a user has just opened the document while being deactivated, he can no longer work on the document and is informed accordingly on the screen about his deactivation. A deactivated user can no longer find the document via the search or can open it via the document link. Deactivated users are also deleted from the "Active" list and then only displayed under the "Inactive" list. If you want to reactivate a deactivated user, simply check the box "Active" again. The reactivated user then appears again in the "Active" list, is automatically notified by e-mail about the reactivation, sees the document again in his document list and can open it again. 54Can I still change the user roles later? Yes, in "Document Options" under "Options" you will find the "Manage Users" with an overview of all users working on this document. Here you can change the roles of the users. But beware: You can only assign the role to other users that you have. This means that if you have the role "Editor", for example, you cannot assign the role "Decision-maker" to other users, since this role has more rights than you have in this case. Furthermore, it is only possible to edit and change the user roles if you have the "Admin" permission, otherwise you cannot access the roles and additional rights. 55I have been invited to a document - where can I see my user role? If you want to know what user role you have in a document, you can simply see this in "Document Options". 56Can I change my user role in the document? Yes, although it is only possible if you have the rights of the administrator in the corresponding document. To do this, click on the tab "Show document options" in the table bar on the left and then on "Manage users". The dialog box opens and you can change your user role. 57Where can I view all users working on a document? An overview of all users working together on a document can be found in the "User list", which you can call up in the header line of each document under "Show document options". There all users are listed including their roles, additional rights and activity status. 58I have been invited to a document - where can I find the new document? You will always find a new document in "My Documents". Then you can move it to another folder as you like. If the new document is still unopened, a notification appears in the left column. This will make it even easier for you to find the new document. If you are invited to a new document, you will always receive an email. You can then simply click on the inserted link and you will be forwarded directly to the document. 59How do I know if someone invited me to a document? If a user invites you to a document, SMASHDOCs will send a notification to your email address. It will show you who invited you, which document has been released for you and also a link with which you can open the document directly. You can also find the new document in the document overview "My Documents", see FAQ (Can I change my user role in the document?). 60How can I insert the changes in review mode? Note: the suggestions for changes can only be inserted if you have the role "Editor" or "Approver" and the section has already been shared for review. In the case of a design section that you have not created, editing is only possible once it has been released for editing. 61Why can't other users edit my new sections in a document shared for review? Newly inserted sections in a document shared for review are first saved as design sections, which you as the creator can only edit. Other users cannot edit the contents of these sections. The only exception: if you are an "Admin" and/or "Approver", you can also share your own design sections and those of other users. 62How can I release a draft section for review? To release a design section for revision, click on the design you want to release for review. A blue arrow appears at the top right corner, click on it, and the section is shared for review by other users. 63How can I check if there are other sections that I have created and that I still need to approve? 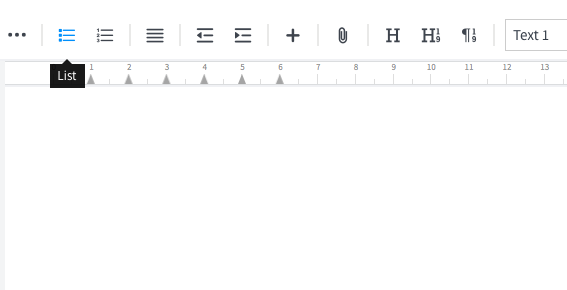 If you still have draft sections in the document you want to publish, the "Show all my draft sections" tab appears on the left side of the tab bar in the open document. This will give you an overview of all your own draft sections in the document. The grey number shows how many draft sections you have in the document that you have not yet released. If you click on a section in the list, you will be sent directly to the corresponding position in the document. You can also immediately release the draft section for revision by clicking on the small check mark. With a click on the button "Share all" you can release all draft sections at the same time. 64How can I incorporate suggestions for changes? To include suggestions for changes, click on the desired section and start typing in the changes directly. When you are done, click on the green button at the top right corner, press Ctrl/CMD + S or simply outside the section and the changes will be saved. Please note: You can only add changes in review sections and only if you have the user role "Editor" or "Decision maker"! 65Who can decide on proposed changes in the document? Changes to the document can only be accepted or rejected by users with the role of "Approver". 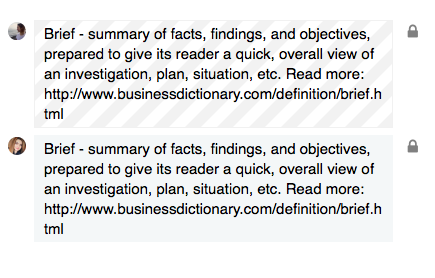 Users with the role "Editors" can only incorporate changes, but cannot decide about them, "Commentators" are allowed to write comments on sections only, and "Raders" can only read the document, but neither edit it nor write comments on it. 66How do I mark changes as seen? You can mark new changes in a document as seen by clicking on the "blue eye" that appears to the right of each section that contains new changes. If you have a document with many new changes, it is easier to call up the list of all changes in the document in the table bar on the left to get a better overview. The number highlighted in red shows you how many new, unseen changes there are in the document. This list gives you information about all unseen as well as all open (pending) changes in the document. By clicking on a change, SMASHDOCs immediately shows you the corresponding position in the document and you can view it directly. Here you can also mark an unseen change as seen by clicking on the "blue eye". You should mark all changes to inform SMASHDOCs that you know about them. Later on you can accept or reject the changes. It is also possible to mark all new changes in the document as read at the same time. Click on the blue button "Mark all as read" in the header and all unseen changes are marked as read. 67How can I accept changes? Please note that you can only accept changes if you have the role "Approver"! If there is an open change in the document that you want to accept, first click in the corresponding section with the open change and then on the green button at the top right margin. An open change is displayed either as green (something has been added) or as red strikethrough text (something has been deleted) in the document. If you accept an added text, the section is updated and the text turns black again. If you accept the deletion of a text or individual words, they disappear from the section. 68How can I reject changes? Please note that you can only reject changes if you have the role of "Approver"! If there is an open change in the document that you do not like and you therefore want to reject it, first click in the corresponding section with the open change and then on the red button at the top right margin. 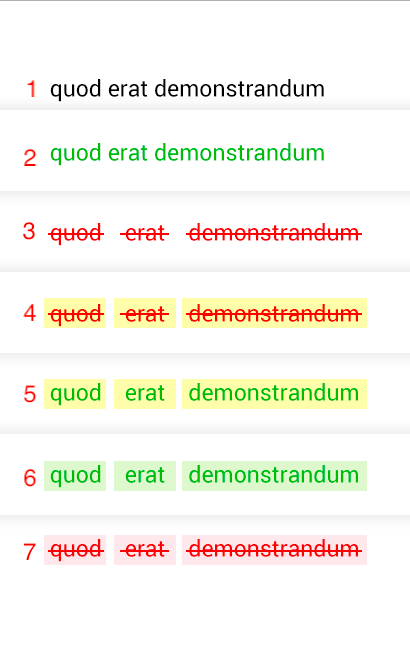 An open change is displayed either as green (something has been added) or as red strikethrough text (something has been deleted) in the document. If you reject added sections or words, they disappear. If you reject the deletion of a section or words, they remain in the document and the text turns black again. 69Why can't I change the contents of a document shared for review? In this case you do not have the required user role. You can only edit the content of documents that are released for revision if you have the role "Editor" or "Approver". 70I deleted a section completely - can I undo it? It is not yet possible to restore deleted draft sections in a document released for editing. However, on the left side of the tab bar, you have an overview of all deleted review sections in the archive. If you should have deleted something unintentionally, you can look there and re-enter the section. 71What is a section history? The section history is an overview of which user inserted, deleted, accepted or rejected which changes and when. The list is made in chronological order. It is displayed either via the section menu under "Show history" or by clicking on the number to the right of each section. 72How can I find out who inserted the content if there has been no section history yet? If the section was shared for review but has no section history yet, go to the section menu and choose the option "Others" => "Show history". The name of the user who created the section will be displayed. 73Where can I view the section history? You can call up the section history for any section, whether text, image or table, either by selecting "Show history" in the section menu or by clicking on the small number to the right of the section, which by the way shows you the number of all changes in the section. 74I like an older version of a section better than the current one - can I restore the older formulation? Yes, by going back to a previous version via the section history. To do this, open the section history and select the section version you want to restore. Then click on the grey button at the right margin and the section will be updated according to the selected version. 75How do I know if there are new changes in a document? As soon as there are new changes in one of your documents, you will receive a notification from SMASHDOCs to your email address. You will only be informed about the affected documents, you have to look at the changes in the document. In the document list on the left all documents with new unseen changes are also displayed, see the figure below. The red number shows you the number of documents with new unseen changes. 76How can I find out whether there are new conversation contributions in a document? As soon as there are new conversation contributions in one of your documents, you will receive a notification from SMASHDOCs to your email address. You will only be informed about the documents concerned, you have to look at the contributions in the document. In the document list, all documents with new unseen changes (including contributions to conversations) are also displayed in the table bar on the left. The red number shows you the number of documents with new unseen changes. In the document itself, the new unseen conversation posts are displayed to the right of the respective section for which a comment has been made. In addition, you have the possibility again to view an overview of all conversation contributions in the table bar on the left. 77What do the different colors and underlays in a document released for editing mean? This text was changed by the user himself or is already marked as seen but the decision is got to be made still. This text was deleted by the user himself or is already marked as seen but the decision is got to be made still. These rejected changes were not marked as seen yet and the decision is got to be made still. These added changes were not marked as read yet and the decision is got to be made still. The accepted insertion or rejected deletion that was not marked as read yet. The rejected insertion or accepted deletion that was not marked as read yet. 78How can I insert new sections into a draft document? To insert new sections into a document, press the ENTER key and a new section appears. If you want to insert an image, you can drag it directly to the desired position in the document and the image section will be inserted automatically. Alternatively, you can click on "Insert image" in the formatting bar and an image section will be inserted. The same applies to tables. Alternatively, you can insert a table section via the formatting bar by clicking on the corresponding button. 79How can I insert new sections in a document that has been released for editing? In a document released for editing, new sections, whether text, image or table, are always first created as draft sections. This allows you to incorporate new content at your leisure and only release the section to all other users in the document for revision when you are done with it. To do this, click on the blue "Share for review" button at the top right corner of the draft section. Only after approval can the section be edited by other users as usual, in draft mode only you can edit the content of the section. You can recognize your own draft sections in the document by the light blue background. In addition, your profile picture appears on the left edge of the section so that you can see at first glance which sections belong to you. A "lock symbol" appears on the right margin, so that you can immediately remember the section as closed. When released, these disappear again and the section becomes a review section. Design sections of other users can be recognized by the white-grey striped background and the lock symbol on the right side of the section. The profile picture on the left side shows you who created the design section. Draft sections of other users are blocked for you and can only be edited by the users who created them. However, you have the possibility to release draft sections from other users for revision or to delete them if you are admin of the document and/or have the role of "Approver". However, it is always possible to move draft sections, even those of other users and even if you are not an admin and/or are not a "Approver". 80How can I insert images? Images can be easily inserted in two different ways. Either you insert a new image section into your document by clicking on the "Insert image" button in the formatting bar, or you Drag and Drop the image directly to the desired position in the document. A dialog box opens, in which you can now assign a caption and numbering. After saving, the image is inserted. With the two blue arrows in the lower right corner of the picture you can finally adjust the size. 81How can I replace images? After clicking on the picture a context menu with the tab "Update picture" opens. Click on this tab to open a dialog window. You can also simply double-click on the image to bring up the dialog box. You can select the new image from your PC or simply Drag and Drop it. The image is updated by clicking on "Save". 82How can I view previous versions of the image? To view the previous version of an image, you can open the tab "Section History". Click on the small number to the right of the section. A column on the right opens and you can view all previous versions of the current image. It also shows which user added which version and when. 83How can I create comments for images? To create a comment for the image, you can click on the image. After clicking a context menu of the picture opens, where you were offered two possibilities to create a comment. You can either immediately select the blue tab "Comment" or "Comment" from the context menu itself. A column for writing comments opens on the right side. Enter your message and decide who can see the comment. A click on "Create" completes the action and the comment is created. 84Why can't I upload an image or replace an existing image? In this case you do not have the required user role. You can only edit the content of documents in revision mode if you have the role "Editor" or "Approver". 85How can I insert tables? To insert tables, simply click on the section under which the table should be inserted and select "Insert table" from the formatting bar. A dialog box opens and you can fill, link and format rows and columns according to your wishes, set the total size and assign a title, which is then displayed as a signature. You have also a possibility to import finished tables from Excel. However, this is only possible via the dialog box and not directly in the text. 86How can I edit tables? 87How can I view previous versions of a table? To view the previous version, you must open the section history. Click on the small number next to the section. A dialog box opens and you can view the previous version of the current table. You will also see who changed what and when. Click on the small number next to the section. A dialog box opens and you can view the previous version of the current table. You will also see who changed, what and when. 88How can I format tables? The cell contents are bold, italic, underlined or strikethrough. Start the edit mode by double-clicking on the table. Select one or more cells and select the desired option in the formatting bar. The content is formatted accordingly. 89How can I add/remove a new row/column? Open the edit mode by double-clicking on the table. Right-click on the table. Select "Insert rows above/below" from the context menu for new rows. Select "Insert left / right column" from the context menu for new columns. If you plan to delete rows or columns, select "Remove row / column" in the context menu. The action ends with a click on "Save" and the table is updated accordingly. 90How can I combine cells? Open the edit mode by double-clicking on the table. Select the cells you want to combine. Right click on the table. Select "Merge cells" from the context menu. The action is completed by clicking on "Save" and the table is updated accordingly. 91Can I import files in Excel format into SMASHDOC? Yes, but only in one table. Copy the content from your Excel file with Ctrl / CMD + C and paste it into the table SMASHDOCs with Cntrl / CMD + V. The action is completed when you click on "Save". 92Can I import files from the Excel table into SMASHDOC? Yes, but only in one table. 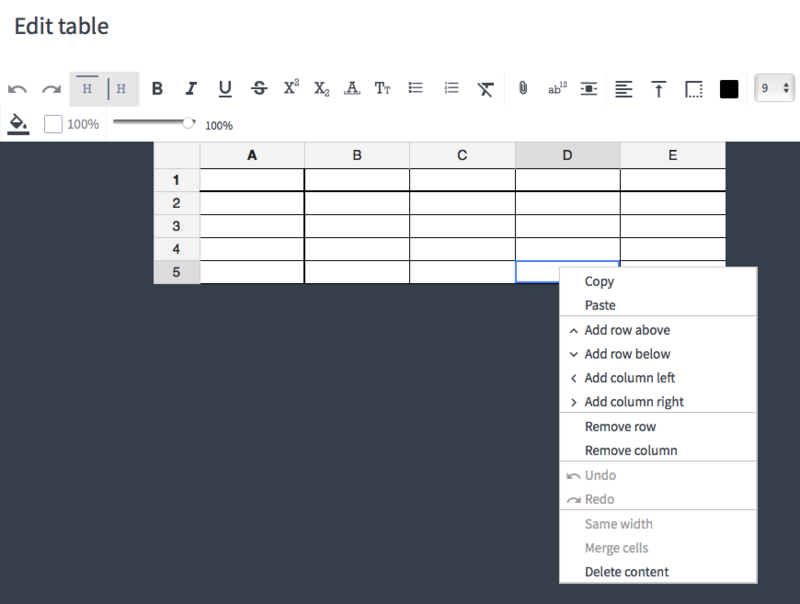 Copy the content from your Excel table with Ctrl / CMD + C and paste it into the table SMASHDOCs with Ctrl / CMD + V. The action is completed when you click on "Save". 93Why can't I insert or change a table in a document shared for review? In this case you do not have the required user role. You can only insert and edit tables in documents that are released for revision if you have the role "Editor" or "Approver". 94How can I insert footnotes? To insert a footnote, simply click where you want to insert the footnote in the document and then click the "Add footnote" button in the formatting bar. The dialog box opens where you can write the contents of the footnote. All footnotes are automatically numbered consecutively. To find a footnote quickly, you can select the tab "Show table of contents" in the table bar on the left and then "Footnotes". All footnotes are listed, but you can also search for a footnote. After clicking on a footnote, the corresponding section will be highlighted. 95How can I edit footnotes? You can either select a footnote in the table of contents or click on a footnote in the text. The dialog box opens, where you can select the tab "Edit footnote". Save your changes and the footnote will be updated. 96Why can't I insert a footnote or edit an existing footnote in a document shared for review? In this case you do not have the required user role. You can only insert and edit footnotes in documents that are released for revision if you have the role "Editor" or "Approver". 97How do I delete footnotes? You can either select a footnote in the table of contents or click on a footnote in the text. The dialog box opens, where you can select the tab "Delete footnote". 98How can I insert web links? To insert a web link, click on the point in the document where you want to insert the web link and then click on the "Weblink" button in the formatting bar. A dialog box opens and you can now enter the URL and the display of the link in the document. Alternatively, you can simply select one or more words and then insert the web link. The display of the link in the text then corresponds to your selection. After clicking on "Save" the text is updated accordingly. You can see the list of all web links in the table bar on the left under the tab "Table of contents". Please note that web links can only be inserted in the text and not in headlines. 99How can I edit web links? You can either select a web link in the table of contents or click on a web link in the text. To edit the web link, click on it. The dialog box opens where you can select the "Edit" tab. 100How can I delete web links? You can either select a web link in the table of contents or click on a web link in the text. To delete the web link, click on it. The dialog box opens where you can select the "Delete" tab. 101How can I create comments? Please note that you should at least have the role of "Commentator" to create comments. Click on the section or select individual words where you want to add a comment. In both cases, select the tab "Comment" in the context menu at the top right of the corresponding section. The dialog box opens to the right of that section. Enter your comment or subject, main comment and decide who can see it. Your comment can be visible to everyone, to selected people or just to you. In addition, you can also set whether your comment is done immediately or the decision has already been made and no dialog is required or will have the unresolved (pending) status. You can delete a comment if it`s a private one or no one has seen it before. Please note that only users already invited to the document can see comments. Who can see comments depending on your settings. The default setting allows all users see your newly created comments. Nevertheless, you can also determine who is allowed to see your comments: only you, all users in the document or only selected users. You can also invite other users later or delete users from the dialogs. 104How do other users know that I have made a comment? 105How do I see comments from other users? 106 Can I write an email to all/selected users from SMASHDOCs? Yes, if you click on the tab "Compose an announcement" in the table bar on the left of the open document. The dialog box opens where you can compose your message. Then choose who should receive them. For "Selected" check in the field next to each user. If you want to send the message to all users, select "All" in the dialogue box. 107 What is an announcement? An announcement is a message that you can send via email to all or selected users from SMASHDOCs. The email sent contains the name of the document and a direct link to open it so that users know immediately which document you are writing about. 108 How do I write an announcement? Click on the envelope icon or the tab "Compose an announcement" in the table bar on the left side of the opened document. The dialog box opens and you can compose your message. For "Selected" check in the field next to each user. If you want to send the message to all users, select "All" in the dialogue box. 109 What is a cross-reference? A cross-reference is a link from one section of the text to another section. The section here also means a numbered heading, an image or a table. 110 How can I refer to a section in the text? Click on the place in the text where you want to add a cross-reference and then on the "Cross-reference" button in the formatting bar. In the opened dialogue box you can choose between figures, tables, signatures, numbered headings. In addition, all possible cross-references are listed in the tab "All". After inserting a cross-reference, a small icon appears to the right of the section where the cross-reference was added. Click on this and all cross-references for this section are listed in detail in the opened dialogue box. Not only cross-references of the corresponding section are listed, but also sections to which reference was made. 111 How can I change a cross-reference? In the text, click the cross-reference you want to change. The dialog box opens, where you can click on the "Edit" tab. After you have finished with the changes, save them and the text will be updated accordingly. Please note that you can only edit cross-references if you are the "Editor" or "Decision-maker. 112 How can I delete a cross-reference? In the text, click on the cross-reference you want to delete. The dialog box opens where you can select the "Delete" tab. Then the cross-reference disappears from the corresponding section. Please note that you can only delete cross-references if you have the role of "Editor" or "Decision-maker". 113 How can I find all sections referenced in a section? To the right of each section that contains a reference, a small icon appears. Clicking on this icon opens a dialog box with detailed cross-references. 114 How do I find the section that was referenced? In the text, click on any cross-reference. The dialog box opens, where you can click on the tab "Go to". After this click you will be shown the section referred to. 115 How do I know that a section has been referenced by the other section? In this case, a small icon appears to the right of the cross-reference section. Click on it and all cross-references are listed in detail in the dialogue box. 116 Are cross-references automatically renumbered when I change the numbering in my document? Yes, cross-references are not only numbered consecutively, but also adapted to document changes in numbering. 117 How can I see if a cross-reference is no longer valid? As soon as there is a broken cross-reference in the document, the tab with the exclamation mark appears in the table bar on the left. A hinwess "broken cross-reference" is also shown in the section itself. When you click on the exclamation point, SMASHDOCs shows you the list of all broken cross-references. Click on a broken cross-reference to highlight the corresponding section in the document. You can either edit or reset a broken cross-reference or delete it. Both solve the problem. 118How can I bookmark the section? Click on the section where you want to bookmark. Select "Bookmark" from the context menu. A small red star appears to the left of the section, which you can use to immediately recognize a bookmark. A small star symbol also appears in the table bar on the left. The grey counter with the number shows how many bookmarks you have in the document. Click this icon to view an overview of all bookmarks in the document. Clicking on a bookmark in this list will take you directly to that section. 119 What is a bookmark for the section? A bookmark is a form of the section mark so that you can quickly find it again. 120 Why do I need a bookmark for the section? You can mark a section with the bookmark to make search of particular information much easier. 121 What is a section link? A section link is an individual link to the section. Each section in SMASHDOCs document has such a command through this link. 122 Why do I need a section link? Each section in the SMASHDOCs document has a command through the individual link. You can send it so that the recipient lands directly on the corresponding section when the link is called and should not search long for it. 123 How can I create a table of contents? A table of contents is automatically created for you by SMASHDOCs. A list is created for all the figures, tables, indexes (including numbered indexes), footnotes and web links and is adapted accordingly if there are changes. 124 Where can I find the table of contents? A table of contents can be found in the table bar on the left. You will also find the lists with figures, tables, footnotes and weblinks. 125 How can I export a table of contents? A table of contents is always automatically exported in HTML format. In Word Export you can still choose which lists should be exported with it. 126 How can I set multiple/fewer levels in the table of contents? In the table bar on the left, click on the tab "Show the table of contents". In the right margin of the list you will find a small drop-down menu for setting the layers. You can choose here until which level the table of contents should be shown. 127 How can I influence the display of different lists? SMASHDOCs automatically creates a list of images when you insert an image. Just as with the table of contents, you can call it up in the table bar on the left under the tab "Show the table of contents". Clicking on a character in the list will take you directly to the corresponding section of the document. The figures are listed in chronological order. SMASHDOCs automatically creates a list of tables when you insert a table. Just as with the table of contents, you can call it up in the table bar on the left under the tab "Show the table of contents". Clicking on a table in the list will take you directly to the corresponding section of the document. The tables are listed in chronological order. SMASHDOCs automatically creates a list of footnotes when you add a footnote. Just as with the table of contents, you can call it up in the table bar on the left under the tab "Show the table of contents". Clicking on a footnote in the list will take you directly to the corresponding section of the document. The footnotes are listed in chronological order. SMASHDOCs automatically creates a list of links when you add a link. Just as with the table of contents, you can call it up in the table bar on the left under the tab "Show the table of contents". Clicking on a link in the list will take you directly to the corresponding section of the document. The links are listed in chronological order. 132 Why can't I insert a web link or edit an existing web link in a document shared for review? In this case you do not have the required role. You can only place and edit web links in documents that are released for revision if you have the role "Editor" or "Approver". 133 How can I insert cross-references? You can create a cross-reference to a (numbered) heading, image or table in the same document. To do this, click in the section in which you want to insert the cross-reference and then in the formatting bar on the button Link -> "Cross-reference". A window will open in which you can select the section you want to link to. You can also choose whether only the numbering of the linked section (e.g. Figure 2) or also its content (e.g. Figure 2 (customer satisfaction)) should be displayed. After inserting the cross-reference, a small symbol appears to the right of the section in which the cross-reference was inserted, which shows you an overview of all the cross-references available in the section with one click. Not only all cross-references from the section to other sections are displayed, but also all that exist from other sections to the selected section. If something is inserted or deleted somewhere that changes the numbering logic of your document, SMASHDOCs immediately checks the correctness of the numbering of all cross-references in your document in the background and adjusts them accordingly if necessary. As soon as a "broken" cross-reference is created, a red tab with an exclamation mark immediately appears in the table bar on the left of the document. Just click on it and SMASHDOCs will show you a list of all sections that contain broken cross-references. Select an entry from the list and SMASHDOCs will navigate you directly to the section with the broken cross-reference. Now you can immediately reset or delete it (both solve the problem). 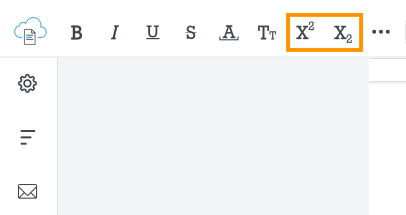 If there are no more broken cross-references in the document, the red exclamation point in the table bar disappears immediately. 134 Why can't I insert a hyperlink or edit an existing hyperlink in a document shared for review? In this case you do not have the required user role. You can only insert and edit hyperlinks in documents that are released for revision if you have the role "Editor" or "Approver". 135 Can I create a table of contents in SMASHDOCs? We have great news for you: Tables of contents are created automatically by SMASHDOCs! For all images, tables, headings (including numbered headings), footnotes and web links, a corresponding directory is created and updated accordingly when changes are made. You can view the tables of contents in the table bar on the left. 136 How can I insert (numbered) lists into a document? For lists you can choose whether you want to number them or not. For both cases, select the sections to be numbered and click in the formatting bar either on "List" or on "List-ordered" and the sections will be formatted accordingly. 137 How can I superscript or subscript a part of a word? For technical reasons you can only superscript or subscript words as a whole. 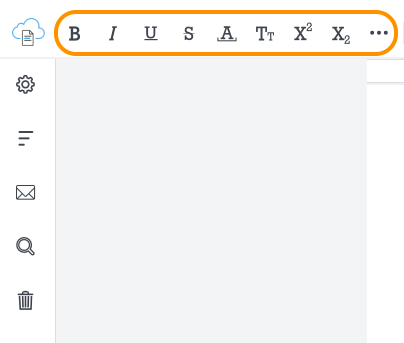 Mark the word you want to superscript or subscript and then click on the corresponding button in the formatting bar, see the following illustration. But beware, tip from the professional: Simply separate the part of the word you want to superscript or subscript with a space from the rest of the word. If you now raise or lower the separated part, the space will disappear and your thus formatted word part will be moved back to the non-formatted part. 138 How can I insert a page break? Right-click on a section of text in which you want to insert a page break. Select "Add page-break above" from the context menu. 139 How can I add a comment to a section? You can add a comment using the context menu of the section. First click on the corresponding section. With a right click the context menu appears by clicking on the "Comment" button. 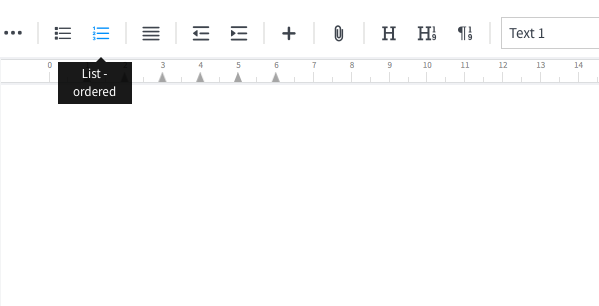 A window opens on the right side of the document, where you can write the comment and determine for which users it should be visible. 140I would like to send a comment only to certain users - is that possible? Yes, by selecting only the users who should see the comment. You can also add more users later by clicking on the plus sign at the bottom of the opened conversation and entering the names of the users you want to add in the dialog box that opens, see the following figure. In addition to individual users, you can make the entire conversation visible to all users working in the document at the same time. Just select "Visible for all" in the dialog window. 141 Why can't comments be made in newly created sections? Newly created sections are always design sections that can only be edited by the author and not by other users; comments cannot be made here either. 142 How can I export / print a document? In the table bar on the left you will find the function "Export" under "Show document options". You can choose to export to a Word file or HTML file. Both formats can then be printed out or converted into a PDF. In HTML export, a distinction is made between the design and the revision because there are several export options for the revision. 143 How can I export a document to a Word file? In the table bar on the left you will find the function "Export" under "Show document options". The dialog box opens where you select Export to Word file. By clicking on the "Export button", the SMASHDOCs document will be exported to a Word document. 144 What HTML reports are available? This is an equivalent of the "pure" document view that has been released for revision. Since no changes can be made in draft mode and no conversations can be created, this is the only mode available for all documents. This report displays the document with redlines and conversations. Previously unseen changes and unread conversations are highlighted in yellow. You can also choose whether all conversations or only those "visiible for all" should be displayed. In addition to the redline and conversations, the process for each section or all changes is also displayed in the corresponding section. All seen conversations are also hidden here. In this case, the report does not focus on the document itself, but on the unresolved (closed) conversations that have not yet been completed. You can distinguish between "visible for all" and "secret" comments. This allows the user to react faster to the conversations. The context of the document can be seen below, although the display of the corresponding section has been minimized. 145 Can I communicate with other users in real time while editing documents, for example by chatting with them? In SMASHDOCs you have the possibility to communicate with other users in real time via the document-internal comment function. In FAQ ( How can I add a comment to a section?) and (I would like to send a comment only to certain users - is that possible?) we show you how to add comments to your document and how to send them to specific users. It is also possible to have very private conversations. 146 How can templates for export be personalized? Personalized templates are part of our premium offer. If you want to know more, click here or drop us a line to info@smashdocs.net. We will contact you as soon as possible. 147 How can I delete my account? To delete your SMASHDOCs account after successful registration, click on your avatar located in the right upper corner of the document list, then proceed to settings and choose the "Security" tab. In the bottom left corner click on "Delete account".